PEEL’s work brings to life the size and scale of the 200,000 hectare Flow Country via a 3D virtual landscape model and interactive carbon game which places the visitor virtually into the landscape and educates on the flora, fauna and culture of this spectacular region. The outputs are variously available online, on kiosks in the visitor centre at Forsinard and on the app stores. The Peatlands Partnership and the RSPB tirelessly work to preserve The Flow Country; a large, rolling expanse of peatland in Caithness and Sutherland in the north of Scotland. Designated as a Site of Special Scientific Interest, the remote peatlands are rather difficult for the public to access and it’s equally difficult to curate their history. However, the ‘Flows to the Future’ project aims to promote and develop knowledge about the peatlands, the role of peat and its carbon storage capability. It aims to educate, engage and connect people everywhere with this precious habitat. It is a fully immersive experience which PEEL believe will be used for years to come, and also opens the door to many similar applications of this technology for other heritage attractions in the future. PEEL Interactive work across the museums, heritage, tourism and leisure sectors to design and produce bespoke interactive experiences. Part of larger organisation The PEEL Entertainment Group, the PEEL Interactive team of skilled writers, designers and creatives combine cutting-edge technology to create inspiring visitor experiences with content that truly comes alive. PEEL’s interactive work is engaging, educational and thought-provoking, with everything from creating and concept to the ultimate delivery of the product all handled by a dynamic in-house team. Using height map data and reference imagery PEEL’s developers accurately modelled the entire expanse in 3D, considering factors such as the seasons and how this affected coloration and the affect weather had on the terrain. They then had to ensure this vast volume of information was easily navigable with a simple and clear user journey to ensure wide appeal. The main application is available through an online web browser, allowing virtual visitors from across the globe to explore this expansive interactive virtual landscape. 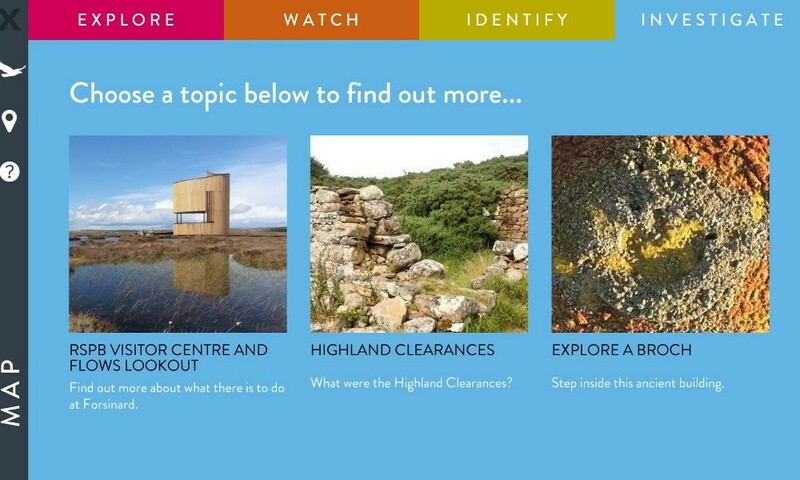 The land model, developed to encompass all 200,000 hectares of Caithness and Sutherland, allows users to experience the terrain, encounter the flora and fauna and understand the cultural heritage of this important habitat. The topography and terrain which the user encounters was recreated with such accuracy that numerous plants and animals which are inaccessible in real life can be explored up close and personal in a way that has previously been impossible, with the ability to learn more through the use of detailed content. The application acts as a multimedia guide to the entire region and includes; film, animation, 3D modelling and oral histories. With the inclusion of multiple entry points, clickable content is dispersed throughout the recreated habitat and adds another layer to the educational value of a tool of this kind. With the scope to include educational material with varying levels of detail this can be tailored to suit the specific needs of both the client and the intended users’ demographic. Through multiple modes of delivery and by incorporating a mixed media approach, PEEL has offered a wide variety of content to accommodate multiple learning styles. 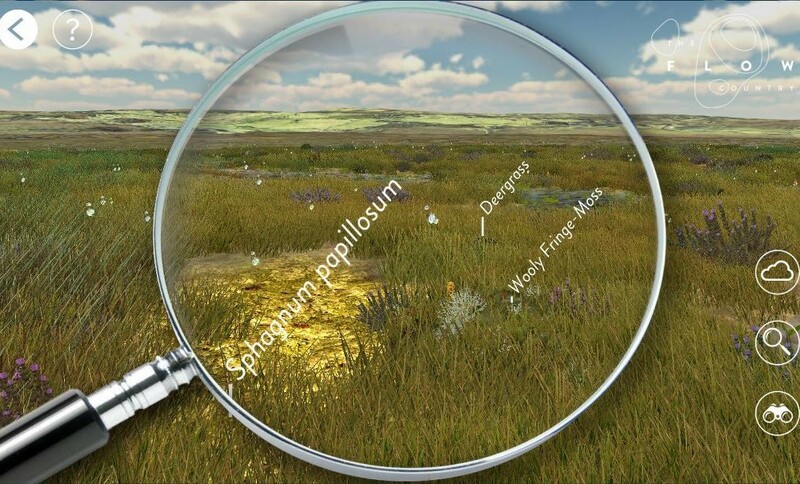 The various plants and animals which can be discovered within the application were hand-modelled from reference imagery and meticulously detailed giving the end user personal encounters with rare carnivorous plants such as the Sundew and species of wildlife such as Greenshank, Golden Plover and Red Deer, which most visitors will not have the opportunity to encounter in real life scenarios. 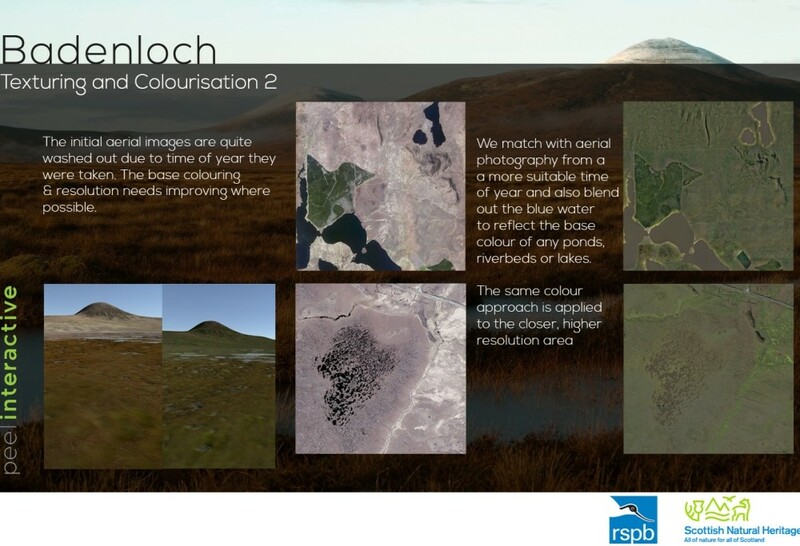 Using 3D models which accurately represent the dynamic nature of the ecological environment mitigates any threat to the preservation of The Flow Country, while still offering the user complete access to the numerous natural artefacts on display. The interactive model is an entirely free-roaming environment, which allows the user to curate their own visitor experience. From using a magnifying glass to search for plants to picking up a pair of binoculars to spot a darting Dragonfly or a Common Frog; they can even change the weather to suit their mood. Upon entering the application, an original composition plays as a bespoke video highlights the breathtaking natural beauty of the largest expanse of blanket bog in Europe. They are then transported to an aerial view of the entire area, with multiple points of interest which guide them through to a range of multimedia information points. In order to engage with a younger audience, fun and informative 2D animations were used to appeal to this particular demographic. These animations touch upon the many historical uses of sphagnum moss, how the peat bogs were formed, and the important role the Peatlands play in storing carbon. 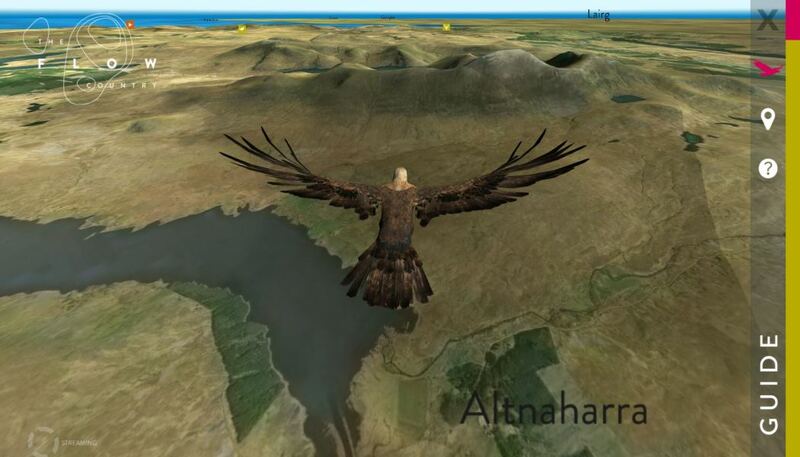 Another feature includes the ability to follow the flight path of a 3d-modelled Golden Eagle as it flies across the entire expanse of the landscape, giving the user a unique perspective of the entire area. The immersive experience is complemented via a bespoke, lightly orchestrated soundscape of birdsong, wildlife and weather, recorded by the BBC’s Chris Watson. From the low buzz of the Common Midge to the distant calls of the Golden Plover. As part of the project brief, PEEL Interactive was asked to create an educational resource in order to engage with school groups across the United Kingdom. The game, which immerses the player in a localised area of the Peatland, poses the question ‘Can you effectively manage the precious Peatland of Caithness and Sutherland, The Flow Country’? The overarching aim to ensure each user benefits from a greater understanding of how Peatland management relies on a long-term commitment which is critical to avoid continued peat loss and the possible negative impacts of this occurrence. 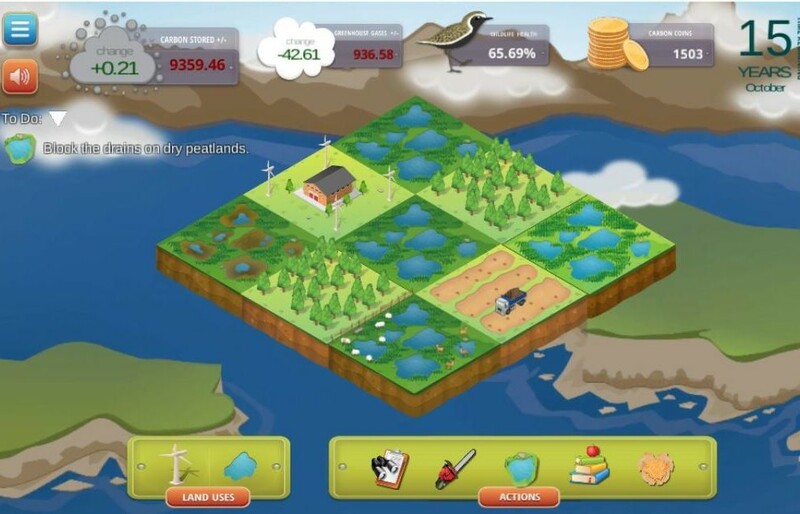 Available through the main multi-media guide, on the web and also as an app for IOS, the educational resource brings to light the global climate change issues to a wide demographic through a hands-on interactive game. When considering audio-visual forms of interpretation specifically for young audiences, games act as a challenging, motivating, and most importantly fun form of learning. “When young people play games it engages an emotional connection through the actions and choices they make and therefore key messages are far more likely to stay with them. When children are immersed in an educational experience, they’re not only likely to learn, but will also want to continue to learn through the medium of the game” says Forster. The Peatlands of Caithness and Sutherland are now accessible in a way that current environmental restrictions do not allow. Users can explore the area in great detail without the risk of damaging the diverse landscape, through an information-rich educational tool which highlights many present and historical issues surrounding The Flow Country. It is a fully immersive experience which PEEL believe will be used for years to come, and also opens the door to many similar applications of this technology for other heritage attractions in the future.